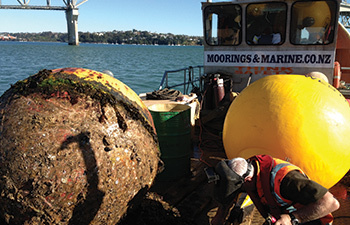 Moorings & Marine are a specialised marine company offering high quality mooring systems. Whether you are a boat owner looking for a mooring, or a construction company requiring professional marine based support services, Moorings and Marine have a successful history in water based safety systems. 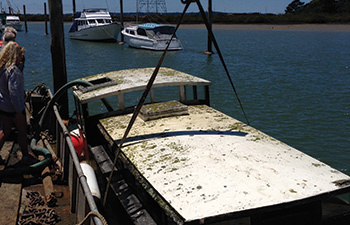 All Moorings & Marine vessels and crew are MNZ certified and qualified. If it’s on the water Moorings and Marine can build it, fix it or find it. With a long history in the maritime industry services range from mooring systems and inspections through to supporting any maritime activity; providing an infrastructure for marine events or contracting to larger construction companies. Moorings and Marine place high importance on safety and seamanship – all training to the highest calibre. Our services cover all aspects of Moorings including new moorings, mooring inspections, mooring repairs, and recovery. We also provide a wide range of Marine construction services, harbour maintenance including: salvage services, gulf island freight services Barge and work boat. View our services page for a comprehensive list of our services. We are an accredited supplier to Auckland Council. Moorings and Marine offer vessels for hire ranging from two self propelled landing barges through to a 6 metre work or safety boat. Depending on your project requirements they can supply a sound and secure vessel including onboard equipment. Visit our services page for vessel specifications. A leading company in the transport infrastructure and construction sector. 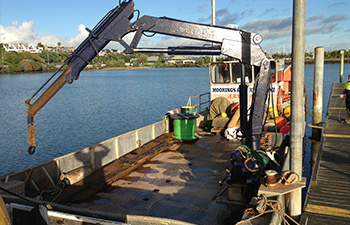 Moorings & Marine has provided support services to Fulton Hogan in water based construction projects. Moorings & Marine has been contracted to provide water based support services to Auckland Transport as they improve, develop and construct Auckland-wide transport projects. Moorings & Marine has a long association with this engineering, maintenance and construction leader. 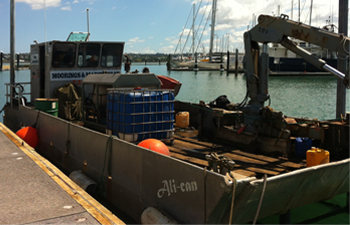 Moorings & Marine is a regular supplier of services to New Zealand’s leading port company. 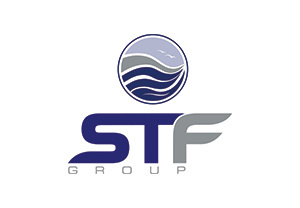 A division of Stanaway Marine Services Ltd.